It’s November again, and I almost forgot to give a shout out for National Novel Writing Month (NaNoWriMo). You know, that craze of getting as much of your first draft written as possible in 30 days? It doesn’t even have to be good writing . . . just done writing. You can read more about it, and also find groups to connect with so you’re not doing it alone, at the NaNoWriMo website. I also wrote about it a while back on the Los Angeles Editors and Writers Group blog. “There are two extreme views about punctuation,” linguist David Crystal writes, “the first is that you dont actually need it because its perfectly possible to write down what you want to say without any punctuation marks or capital letters and people can still read it youdontevenneedspacesbetweenwordsreally.” The second is that punctuation is absolutely critical, not only for clarity but also to show other people that you’re educated. In her New Yorker article A History of Punctuation for the Internet Age, Adrienne Raphel discusses Crystal’s take on punctuation and the internet. Like many linguists, Crystal is pretty laid back about the unstoppable “corruption” of the English language. Linguists don’t even see it as corruption; it’s just the inevitable morphing that’s innate to language. In fact, in linguistics the word grammar doesn’t mean those pesky rules you have to learn to speak and write English correctly. Grammar, to a linguist, refers to the innate rules users of a language follow without even knowing they’re following them. This kind of grammar is not about right and wrong, but about occurring or not occurring. Thus, to a linguist, the sentence “I ain’t readin’ no frickin’ books ‘bout punctuation” is not an incorrect utterance if that’s the way English is spoken in the speaker’s dialect or group. All that said . . . I am still a book editor. Although I do love our ever-changing language and celebrate the style and ingenuity of individual speakers and writers, I also have a thing for the rules of English grammar (and I don’t mean the “grammar” linguists refer to). Misunderstand me correctly (as my Swedish friend likes to say): I’m not saying you should never break the rules. Heck, I broke a rule a couple of sentences back when I ended the sentence with a preposition. But, when it comes to writing in a publishable or cyber-publishable form, know the rules before you break them. That way you can break them well. Interested in reading more musings on grammar? Check out Grammar Matters and Confessions of a Perfectionist. Did you know that November is National Novel Writing Month (NaNoWriMo)—a month-long novel-writing frenzy? Thousands of coffee-fueled writers are pounding their keys to reach their goal of producing 50 thousand words before the stroke of midnight on November 30. Read more on the Los Angeles Editors and Writers blog. 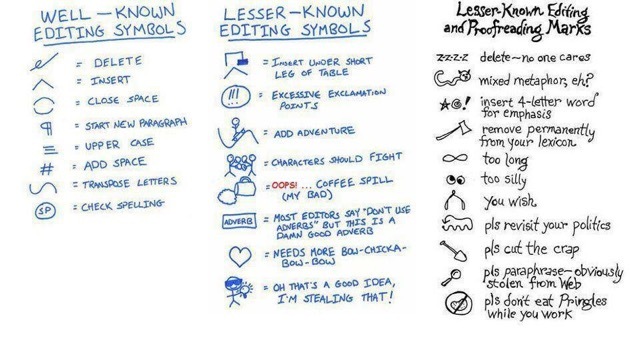 Just in case you have an editor who still works on hard copy (I do occasionally so I can take a break from my computer), the chart below may help you decipher some of the symbols your editor scrawls in the margins. This came my way via cyberspace, origin unknown. If you know who the creator is, please let me know. Grammar Matters: Lie, Lay, Lain, Oh My! The sound of fingernails on a chalkboard has never bothered me. However, when someone says, “I was laying around,” I cringe from my toenails to the tips of my hair. The worst part of it is this: Because the incorrect form is uttered so much more frequently than the correct form, it’s probably just a matter of time before the wrong verb pops out of my own mouth. The over-exposure effect. But I have a plan of action to avert, or at least delay, the onset of incorrect verb reiteration. It’s my secret mantra. My concealed weapon against the decrepitude of the English language. It goes like this: Someone unwittingly uses the verb “lay” when it should be the verb “lie” (as in, “I’m going to lay down”), and I focus my special powers and conjure up my mantra: “lie down, lie down, lie down.” . . . That’s it. Kind of like the New Age pronouncement of “Cancel, cancel, cancel” when someone has a negative thought. Of course, I don’t generally say my “mantra” aloud. My goal is not to be obnoxious; I just want to reinforce the correct usage in my own head. I am, after all, a writing coach and book editor. It’s my job to keep this stuff straight. Please lie on your right side. This verb does not act upon a direct object (noun). In these examples, the book and your body are direct objects. The verb acts upon these nouns. In my own sentence above, “I’m going to lay it all out for you,” it is the direct object. But it gets a little tricky when we move into the past tense. Now that I’ve drawn a line neatly between lie and lay, I’m going to confuse you by telling you that the past tense form of lie is lay. Oy! Let’s lie down in the grass. When he lay on the bed, it creaked under his weight. He had lain in bed for an hour before falling asleep. “Lay the gun on the table where I can see it,” the cop said. She laid the book on top of the dresser. They have laid the issue to rest. After I put the book back on the shelf, I will lie down on the floor. In other words, for present tense you’re mostly going to say lie, and for past tense you’re mostly going to say lay. You might be asking yourself: “Why does any of this matter? People know what I’m trying to say whether I say ‘lie down’ or ‘lay down.’” . . . It’s true, people will know what you’re trying to say . . . but there will be those among us who hear fingernails on a chalkboard. Think It’s Hard to Get on a Bestseller List? The sought-after mark of . . . excellence? Well, yeah, maybe it is. . . . But not as hard as it used to be. Why? Because the bestseller lists—of which there used to be only a handful, a small handful if you count only the ones that counted—are proliferating. The New York Times Book Review recently announced that their own collection of bestseller lists will be expanding. 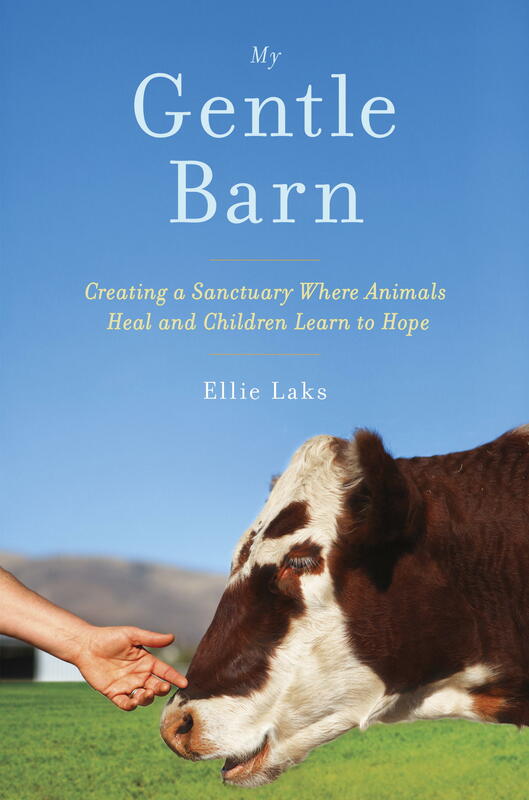 They are adding a gaggle of lists, including Travel, Humor, Family, Animals, Politics, Celebrities, Graphic Novels, and more. Perhaps having more bestseller lists will make that prized BESTSELLER honor more accessible . . . and yet, won’t that make it simultaneously less meaningful? You be the judge . . .